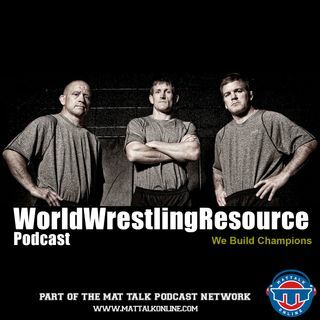 Welcome to the World Wrestling Resource Podcast, we're joined today as we start looking towards the wrestling season and the upcoming World Championships with Jon McGovern, head coach at the University of Dubuque and two-time NCAA Division II champion, Terry Brands Freestyle World Champion and Associate Head Coach at the University of Iowa and Dennis Hall, Greco-Roman World Champion. Moving into our coaching discussion. Coach Brands, what should coaches be doing this fall to prepare for the season? -- Regardless of the program, what are the key points that college coaches need to understand about their athletes, whether it be Division I, Division III, NAIA? -- Coach McGovern, being at the Division III level, what differences do you have to deal with when coaching your athletes. You've got guys who aren't scholarship athletes, you might even have some playing other sports. You've got an interesting perspective, since you've also coached at the Division I level as well. Coach Hall, youth wrestling and wrestling below the high school level has exploded with big participation numbers, USA Wrestling has record membership numbers, so there are a lot more kids wrestling. What can youth parents and coaches do for their sons and daughters to prepare for the upcoming season? Now we move to the upcoming World Championships in Tashkent, Uzbekistan. The U.S. is bringing an extremely exciting team to the mats in freestyle. Coach Brands, before we talk about the individual athletes, as a whole, you were coming through in an era with some great teams. How do you think today's World Team compares to some of the great teams you were on in the past? -- Specifically about the two athletes from the Hawkeye Wrestling Club, you've got a first-timer in Tony Ramos and you've got a three-timer with Brent Metcalf. It might be a loaded question to ask what do you expect from them, but ... well, what do you expect from them? Dennis, we've got a new national team coach in Greco-Roman with Matt Lindland. The U.S. hasn't won a medal in Greco-Roman wrestling since Dremiel Byers won silver back in 2009. What does Coach Lindland have to do to get our World and Olympic Teams to start winning medals again? -- This year's team has a mix of experience and youth. Spenser Mango is on his seventh-straight World or Olympic Team, he was fifth last year. Justin Lester is a two-time world medalist and he is taking advantage of the new weight class at 71kg. Then there's repeat World Teamers as well with Andy Bisek, Jordan Holm, Robby Smith. What are you hoping to see in Uzbekistan and how well do you think Team USA can perform? -- We recently wrapped up the annual NWCA Convention in Fort Lauderdale, and Jon you were there and some of the key topics were about focusing on what the critical areas for wrestling are, skin infections and prevention and of course, the National Duals. What were some of the takeaways you got from the Convention on a program-specific level and from a wrestling in general perspective?